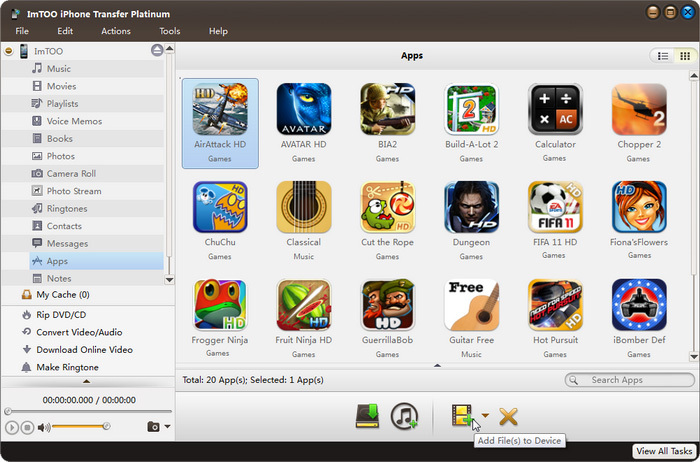 ImTOO iPhone Transfer Platinum makes it easy to transfer and backup videos, music, photos, messages, contacts, apps and eBooks from iPhone to computer/iTunes or from computer to iPhone and let you copy any DVD movie/CD music/audio/video to iPhone, download and convert online videos in one-step, create iPhone ringtones from your favorite music or movies, import contacts from incredimail. Works perfectly with iPhone/iPad/iPod, and fully support multiple devices simultaneously. 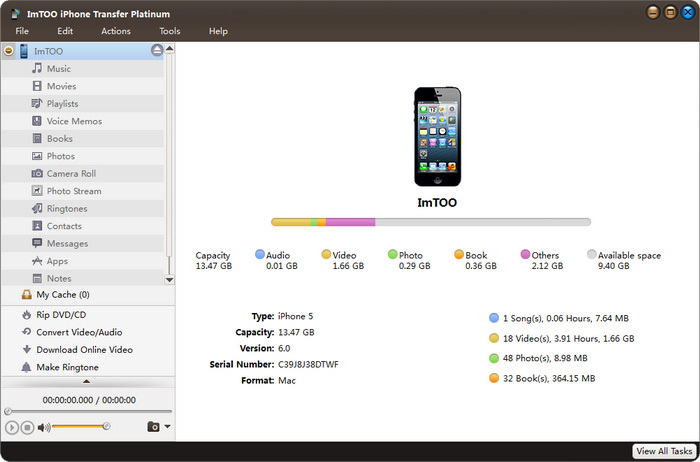 ImTOO offers the best solution to manage, organize and edit multimedia files for iPhone. 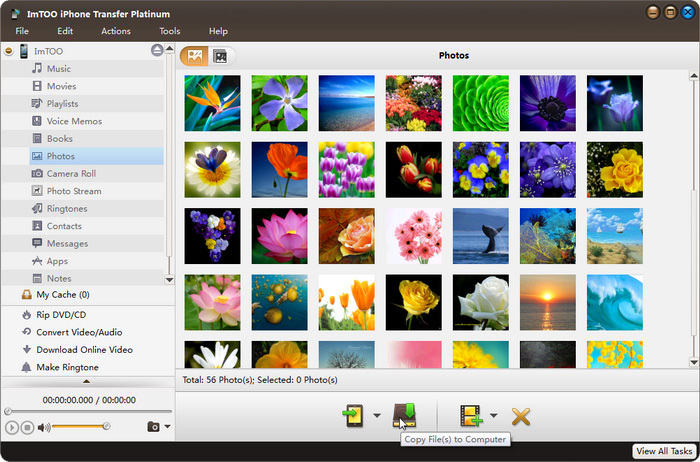 You can establish photo albums and playlists as wish, preview media files within the built-in player, logon the most popular online video websites in embedded web browser and etc. 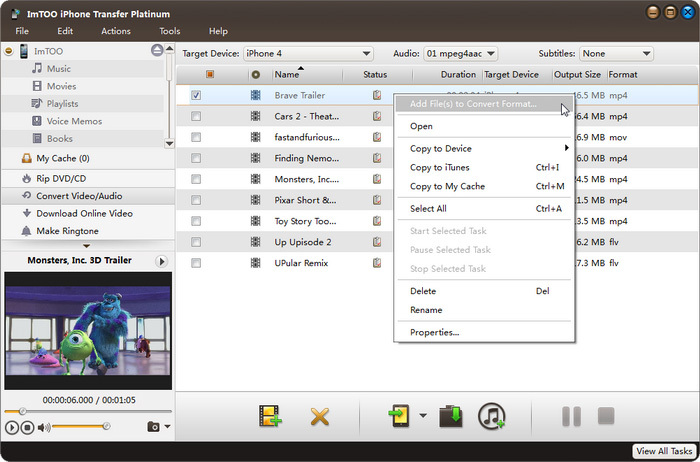 with ImTOO iPhone Transfer Platinum, you can have any video, audio and DVD on your iPhone. Free to transfer music, videos, photos and eBooks from computer to iPhone quickly and efficiently. Backup your iPhone music, movies, photos and eBooks to computer without worrying losing content when accidents happen. Copy photos from photostream to PC. 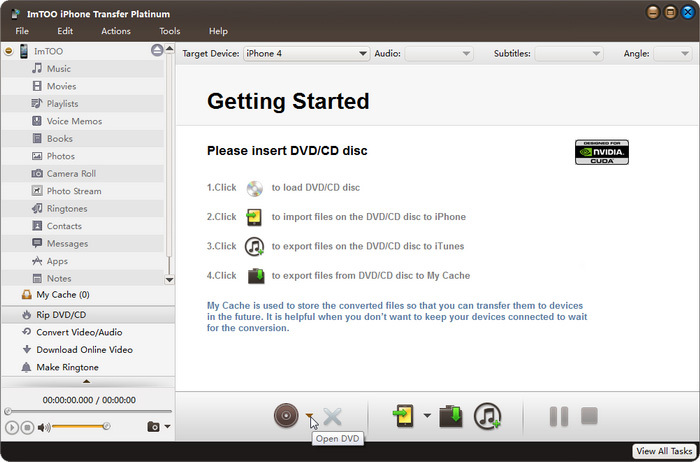 Convert DVD/CD to iPhone compatible movies/music with excellent output quality, then transfer to iPhone directly. 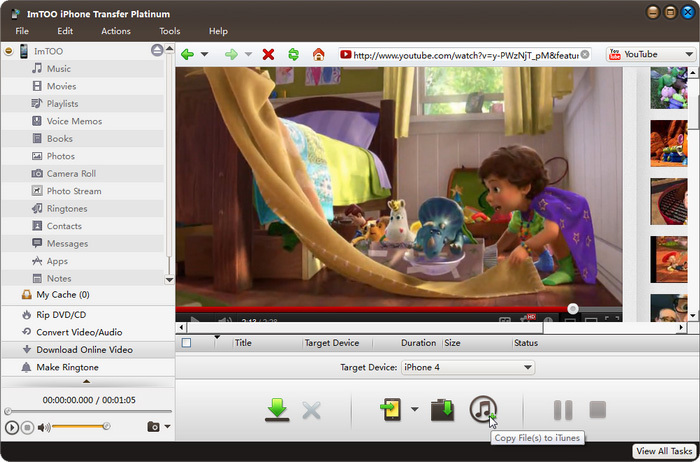 Convert and export almost all popular video and audio formats to iPhone, such as AVI, FLV, MOV, MKV, WMV, MPG, MTS, RMVB, M4V, WMA, OGG, etc. 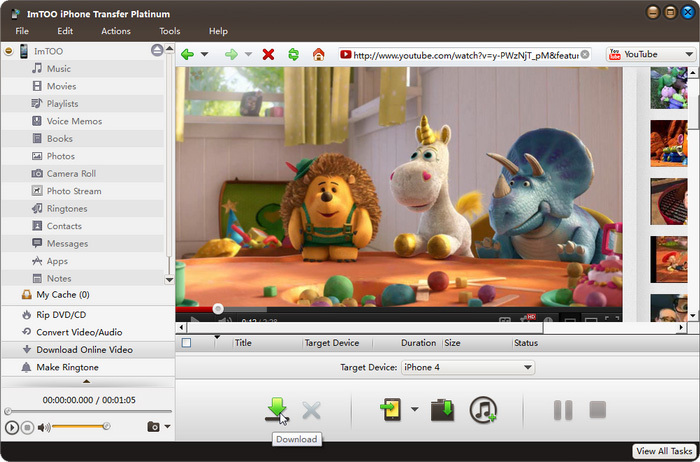 Function as an online video downloader and converter which can download and convert online videos from top online video websites. such as YouTube, Metacafe, Dailymotion, Break, Vimeo, Revver, Blip, Vidilife and Stickam. 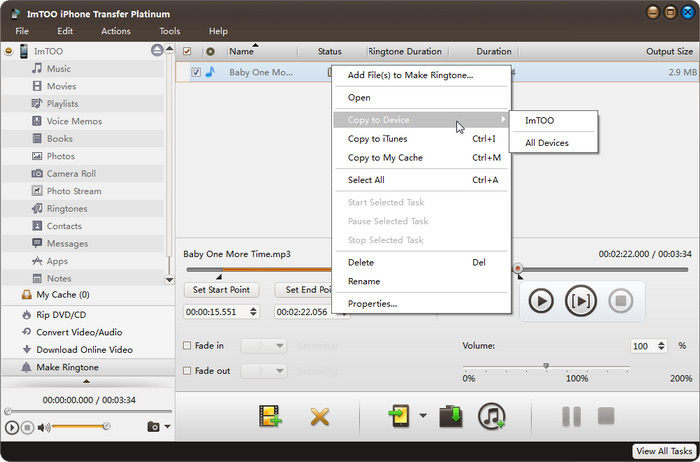 Make personalized iPhone ringtones from audio and video files and transfer to iPhone at once. Fully support output files for iPad, iPad 2, iPad 3, iPad 4, iPad mini, iPad mini 2, iPad mini 3, iPad mini 4, iPad Air, iPad Air 2, iPad Pro (12.9/9.7/10.5 inch), iPod, nano (5th Gen), iPod mini, iPod shuffle, iPod classic, iPod touch, iPod touch 4, iPod touch 5, iPod touch 6, iPhone, iPhone 3G/3GS, iPhone 4, iPhone 5/5S/5C/SE, iPhone 6/6 Plus, iPhone 6S/6S Plus, iPhone 7/7 Plus, iPhone 8/8 Plus, iPhone X, iPhone XS, iPhone XS Max, iPhone XR. 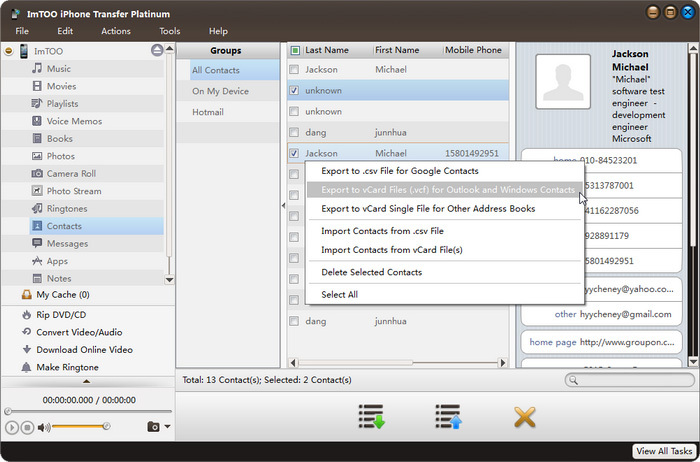 Drag and drop application between PC and iPhone, also support to manage application document. If you have lost your data connection cable, don't be panic, ImTOO iPhone Transfer Platinum support data sync via Wi-Fi. 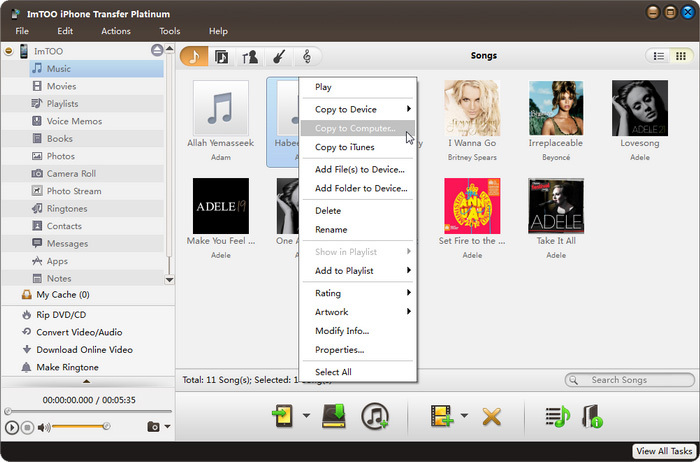 Copy music, movie and playlist not only to device or computer, you can also copy them to iTunes. 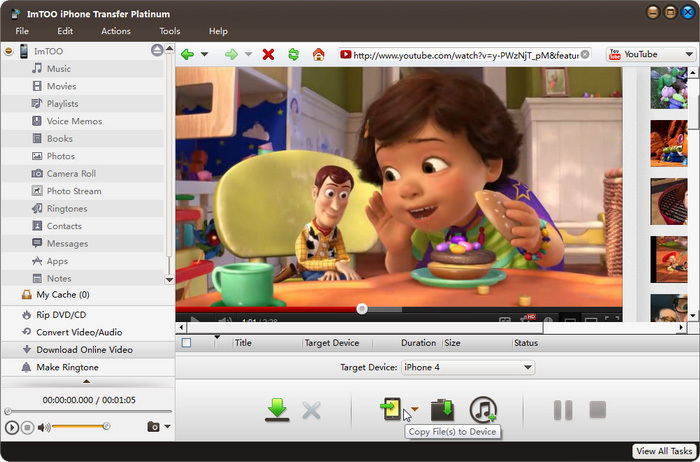 Show music, movies and photos in multiple view types (e.g., songs, albums, artists and genres), and column for showing the details of file could be customized. NVIDIA GPU acceleration is enabled to accelerate the processing speed and promote the performance in converting and transferring operations. 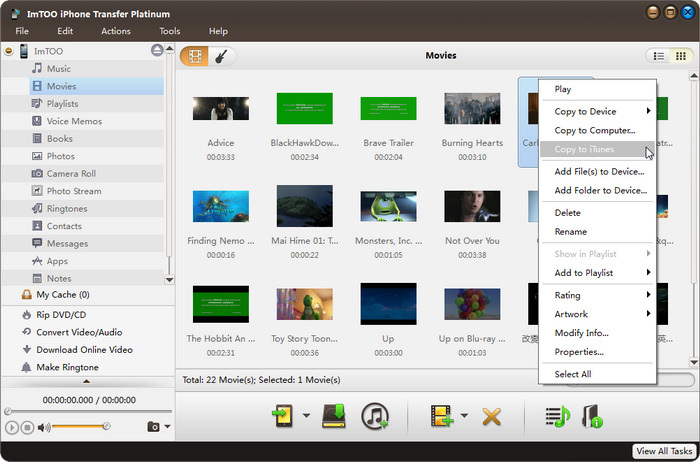 Provide a convenient built-in player for preview DVD movies, photos or videos shot by the devices and export them willingly.